Just a few short hours from Salt Lake City, (a little more if you take an unplanned detour or two, an adventure in itself with quaint villages nestled up to rolling hills and high altitude passes) is the lovely town of Torrey. This is the gateway to Capitol Reef National Park and an ideal setting to meet up with like-minded women for a two-day tourism industry retreat. Driving into Torrey on Utah's Scenic Highway 24 at sunset is truly a magnificent experience. As the sun fades, the colors of the red rock change from brilliant crimson to a soft, deep rose and then darker still as the rocks become shadows on the landscape. First stop, reception and dinner at Café Diablo, a restaurant specializing in innovative gourmet Southwest Cuisine - hardly one you would expect to find in this rural part of Utah. The Café's decor itself is simple - simple tables, simple chairs, but walking through the restaurant is like strolling through an art gallery. And in some ways it is. Café Diablo displays the largest gallery of fascinating Coyote Art in the world. Owner and Certified Executive Chef, Gary Pankow, greeted us as the friendly staff delivered delectable, eclectic meals topped off with an assortment of pastries for dessert. It was a great gathering place for our group of women to renew acquaintances and create new ones. 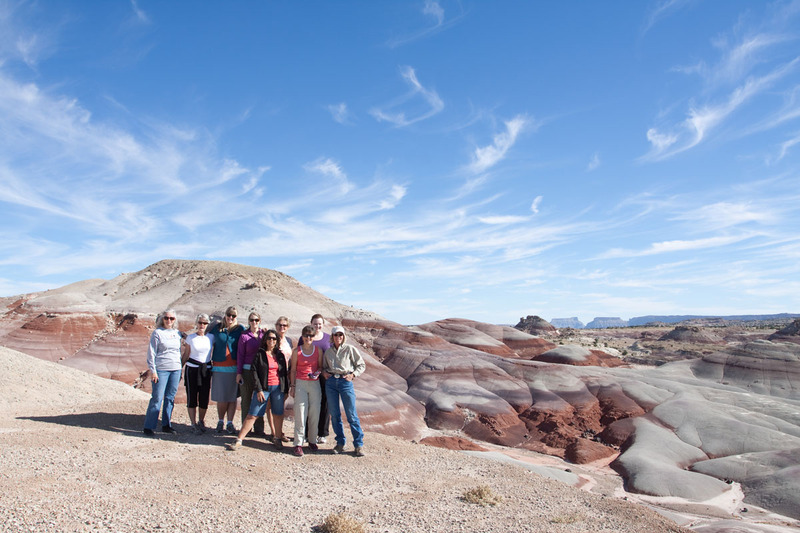 This ‘retreat' was an opportunity for women who normally meet in offices, at trade shows and conferences or communicate only via email or telephone, to join together to network and experience the wonders of Southern Utah, specifically enchanting Capitol Reef National Park. As the evening slowly faded, we took leave of the restaurant to drive back down Highway 24 a short way to our accommodations, The Lodge at Red River Ranch. Another unexpected treat awaited us there. Anticipating simple hotel type accommodations, we were pleasantly surprised when we entered a true western lodge. The Lodge at Red River Ranch offers exactly the type of experience that conjures up images of the Old West. Built with rustic logs and beams, a floor to ceiling rock fireplace at its center, the lobby engulfs every visitor with history. Each of its 15 guest rooms are uniquely decorated with antique furnishings and fireplaces. Comfortable beds are a welcome respite after a long day on the road or hiking trails. When morning dawns, there is no disappointment, only awe and wonder as the sun dances on the spectacular red rock that surrounds the Lodge. At breakfast we meet our guide for the day, Pat Kearney of Hondoo Rivers & Trails. 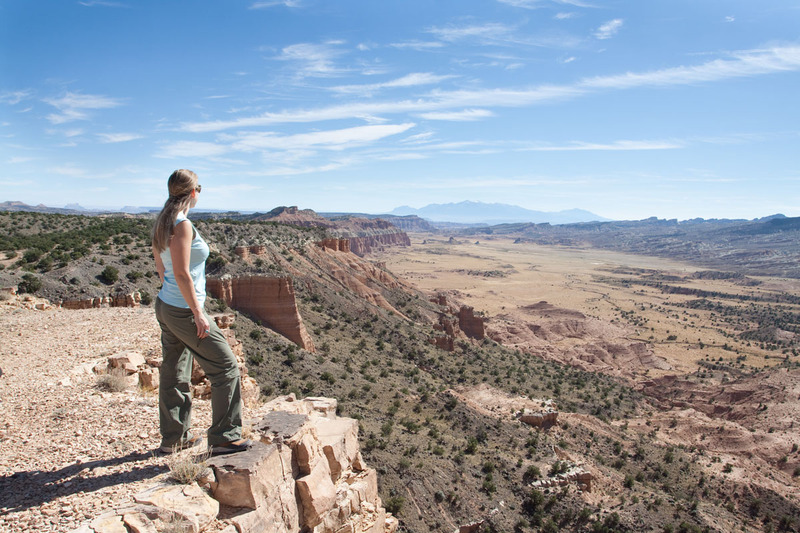 One of the two owners of Hondoo, Pat is a woman with a passion for the Utah outdoors and a wealth of knowledge of the natural history of the Capitol Reef area. We departed in Hondoo's 15-passenger 4x4 van for the park's remote Cathedral Valley and a vehicle tour covering 59 miles of off-road scenic travel. The idea of riding in a van for a full day on unpaved roads with fourteen women, dust swirling in open windows, may not sound like a great retreat experience, but the scenery, the landscape and vistas of Capitol Reef overcame any discomfort. Cathedral Valley is a geologists dream. 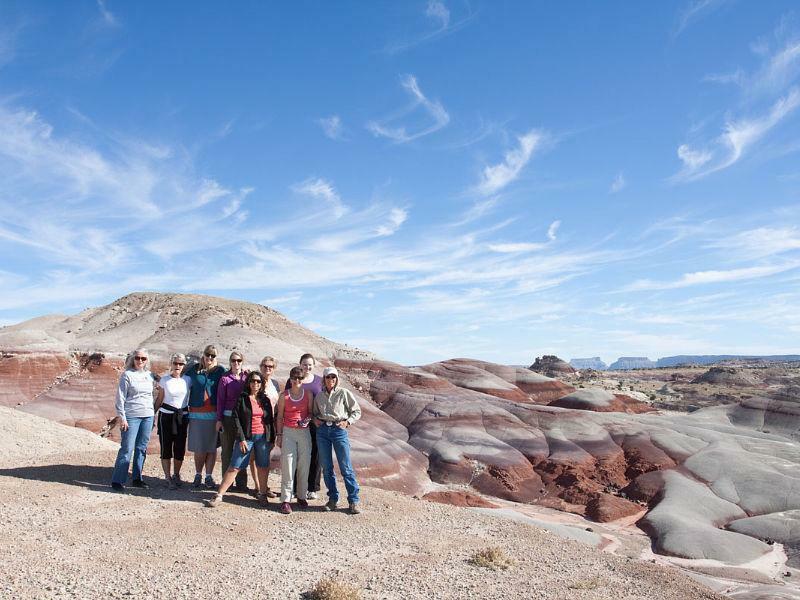 The layers of rock, shale, clay in varying hues of brown, red, gray, green and purple create a variety of geological interests dating as far back as the Jurassic period, over 160 million years ago. We found them beautiful and breathtaking. The tour stopped for a well earned lunch break at the Cathedral Valley campground where, much to our pleasure, there were clean and tidy restrooms in this remote backcountry. The highlights of Upper and Lower Cathedral Valley are views of the Sun, Moon and Stars. These three sculptured monoliths are composed of pink sandstone and are quite magnificent to observe and walk around. They are still locked in my memory as a sight to behold. Not long after leaving the Sun, Moon and Stars, the van pulled up and out of the dirt and, finally, onto the paved road. We were relieved and yet inspired by the beauty and serenity of the untouched landscape we had just witnessed. Our final morning was filled with an hour of yoga and breakfast on the deck of the Cougar Ridge Lodge in Torrey, a state-of-the-art luxurious lodge with a beautifully serene and colorful backdrop. Cougar Ridge offers a wide assortment of activities, including a selection of hands-on private classes, a variety of guided adventures and the opportunity to relax and take in the red rock scenery before our final adventure. 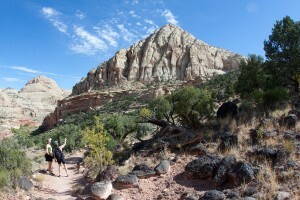 Back to Capitol Reef National Park for a hike up through Cohab Canyon. 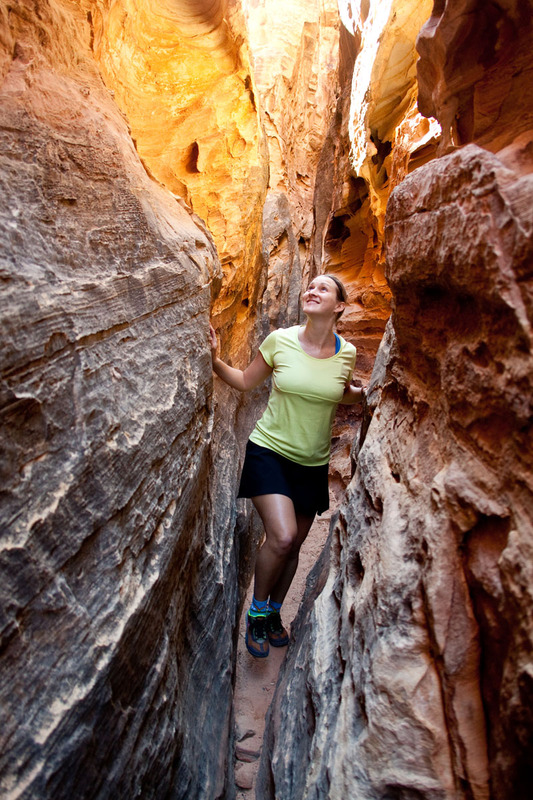 This moderate trek climbs to a hidden canyon with a spur trail leading into a narrow slot that offers those who would take the detour a taste of canyoneering in tight spots. 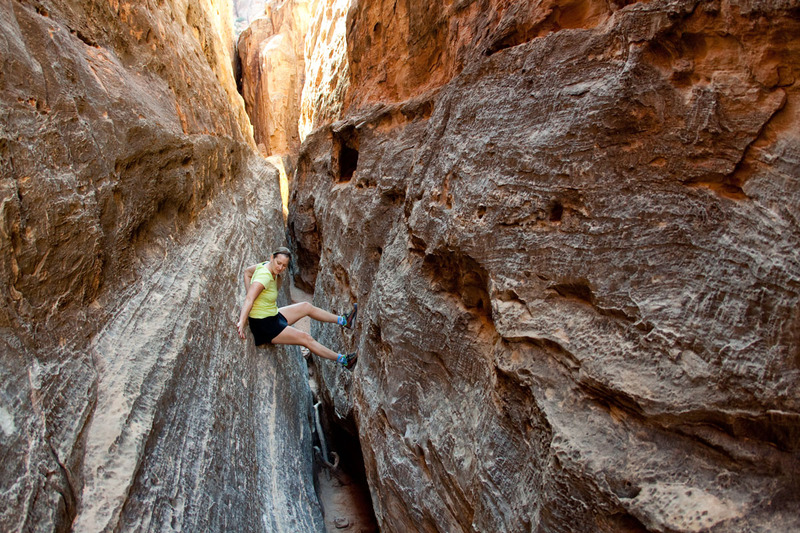 For the adventuresome but not for the claustrophobic! We hiked on a dirt trail that led onto rocks and boulders where we stopped for lunch and photos with now familiar friends. As we sat on the warm red rock surrounded by spectacular views we marveled at the superstar of Capitol Reef, the massive Waterpocket Fold, captivated by its sheer magnitude and enormity. The silence of the moment was only exceeded by the camaraderie that we all experienced. Finally, before heading off to our diverse destinations, we gathered for one last time at the Red Rock Candy Company in Torrey to sample and purchase home-made sweets, a must-have for any trail-weary traveler. A fitting end to our two day retreat.